Lake Ontario is responsible for a peculiar situation for letters to Upper Canada or Canada West as it was sometimes called. Letters to Upper Canada were regularly routed via Queenston at the western end of Lake Ontario, the closest routing to most of Upper Canada. However, Upper Canada extended all across the northern edge of Lake Ontario and a short way east along the St. Lawrence River. 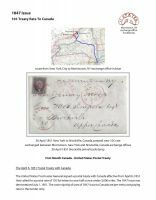 Letters addressed to post offices at the eastern end of Upper Canada were rated 1l ~1 (20Â¢) if exchanged via Queenston, whereas adclressors who requested a shorter cross bord er routing to the same post office (Brockville) via Morristown, N.Y. had those letters delivered without any Canada postage due. Peculiar, but true, the reason being that letters exchanged via Queenston had to backtrack along the northern side of Lake Ontario and required the 10d. sterling rate for distances 201 to 300 miles. The 1l ~1 Canada currency equaled 10d sterling. Letters directed via Morristown went that way and because Morristown was the exchange office opposite Brockville on the St. Lawrence River, no Canada postage was due.